Sciatica is a condition that results from the compression of several nerve roots in the lumbar spine. This may result from medical concerns relating to the tissues and bones in the lumbar spinal column and can cause daily pain for the patient. Individuals who suffer from sciatica can feel intense symptoms, because the nerves connect to the legs, hips, buttocks, and feet. A nerve root injury can happen at any of the vertebrae in the spine, there are five in total. This is referred to as L1 through L5. This type of pain can also occur at the upper portion of the spine, or the sacrum. Common symptoms may include weakness, numbness and tingling. The extent of the pain depends on the injury sustained. Damage at the L2 level can create hip weakness and thigh pain. Damage at the L3 level can create knee and thigh weakness. Damage at the L4 level can cause pain from the lower back to the foot. Damage at the L5 level can create pain from the outer leg to the top of the foot. Damage at the S1 level can create pain from the calf to the outer foot. Herniated disc is a common cause of sciatica. This is formed from a rupture in the outer wall of a vertebral disc, which is a fibrous type of wall. The soft nucleus then begins to bugle outward of the area. The bulge can then harmfully press on the nerve root. Degenerative disc disease is another cause of sciatica. This nerve root injury occurs with the wearing of the spinal disc. This makes the vertebral bones shift out of position above and below the area. When these bones touch, they pinch the nearby nerve roots. Spinal stenosis occurs when the discs, joints, or bones of the spine start to fall apart. This can cause bony spurs to form, which are then pushed into the spinal canal. 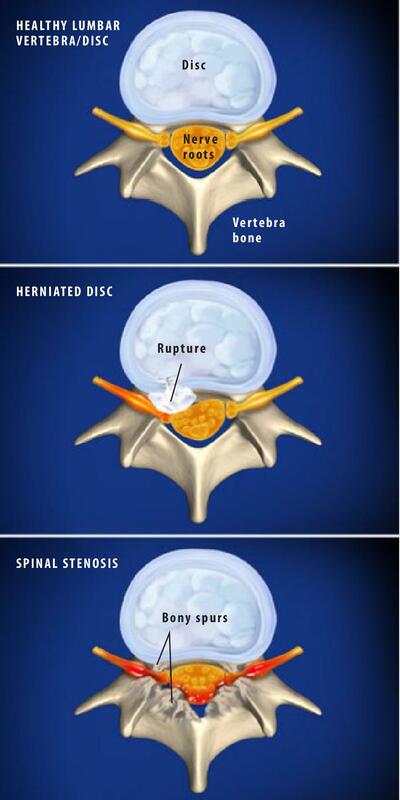 Spinal stenosis can lead to potentially harmful pressure being pushed against the nerve roots. Dr. Trujillo specializes in pain management options including lumbar radiculopathy. If you think lumbar radiculopathy may work for you, please call our office at 928-532-1605 to set up a consultation.